There are too many troubling aspects of the Jamar O Neal Clark killing and events leading up to the fatal early morning hours of that November night – an event that actually began with a series of episodes over many months involving police brutality. He had a case and that case ended with his death. If we see with our hearts’ and not just with our minds’ eyes, there is no doubt that this young man was denied his rights and essentially murdered in cold blood; and that the account by law enforcement has been manipulated, not to serve the public good, but to serve its own interests. The irony, then, is that this kind of “justice” serves no one, least of all the police department. Why would the police pull Jamar out of view of the camera and out of the light? Wouldn’t lights and clear video footage have been helpful to assure a doubting public that the police acted within reason to serve and protect this community? The police officers and the EMS deputy, 5’11 and 220 lbs, are big men. Both officers had guns, while Jamar was unarmed, a slim man standing 5’8″, no more than 160 lbs, and only 24 years old. Were these men armed with reason instead of guns, perhaps this young man would still be alive. As the EMS deputy approached, Jamar stepped back from the ambulance. Two minutes later, he appeared lifeless with a bullet through his temple … after, it appears, having had his left wrist cuffed by Schwarze while Ringgenberg maneuvered the right hand over his head, without struggle, and slammed Jamar to the ground. NO time to ask questions or use reason with this young man, to get to the truth of any matter. Why was any violence necessary? Why did Officer Ringgenberg use this take-down tactic when he was, obviously, not adept at using it, claiming this slight young man, Jamar, was reaching for Ringgenberg’s holstered gun as that officer lay on top of him and the other officer held a gun to his head. It doesn’t take much in the way of smarts to know that this was a no-win situation for Jamar. By most all witness accounts and by video evidence, there were no signs of any struggle from Jamar; but the EMS MVR does show Officer Ringgenberg flailing his legs wildly while laying on his back on top Jamar after the take down at the time of the shooting. Does it seem reasonable that a trained officer would put himself in this position, placing his holstered weapon next to Jamar’s hands, when Jamar could have been easily cuffed standing. 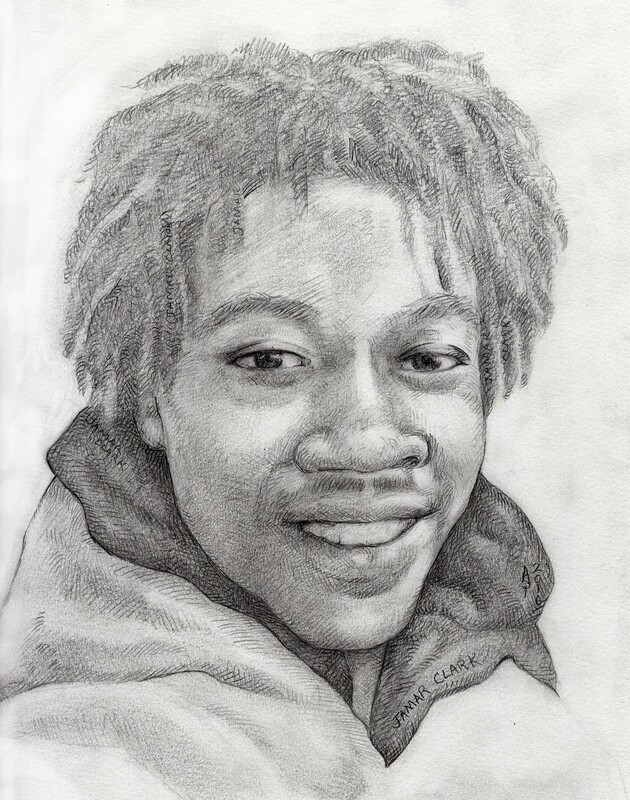 By all accounts except his assailants, Jamar Clark was peaceable as he stood waiting for police officers and the EMS deputy on the boulevard. Rayann Hayes’ says her last memory of Jamar alive was at the ambulance window looking in. According to Rayann, she was given pain medication and remembers nothing after this in the EMS vehicle. Why are relevant medical records closed to public scrutiny? Why was ambulance #443 not sent to the forensics garage? Why are the run reports for the two ambulances not available to public scrutiny? Did Attorney Freeman take into account conflicting reports on the sequence of events involving the security of EMS vehicle #419 the night of the shooting? May we have an accounting of all officers and attendants involved with ambulance #443 at rest two blocks away from the scene of the crime, before it was driven to HCMC with Mr Clark? What of the red bag placed in Jamar’s transport after he entered, and then another identical (or the same) red bag quickly taken out, before ambulance #443 left? EMS deputy Trullinger then placed this red bag next to an officer at the crime scene. There is no red bag documented at the crime scene. Shouldn’t the crime scene have been secured immediately? As it was, video evidence and key witness accounts indicate that there were many unidentified officers walking in and out of said area. Yet very few officers give testimony to this. The views of Jamar’s wrists, taken for forensics, are obstructed by bandages, tape and tubes. Only what appears to be the underside of Jamars’ right wrist is shown with the bandage lifted, and this photo is blurry. The left wrist on the underside is not shown. No fluid of any kind was moving through those tubes. Had Jamar died at the scene? He suffered cardiac arrest with a bullet through the temple that lodged in his brain. Upon exit from ambulance #443, there is no IV on Jamar’s left wrist as it limply falls off the side. The IV was in his right wrist; and it too fell off the side of his transport. Crucial details are obscured in the videos from both ambulances and at very low resolution (360). Shouldn’t an EMS MVR be of better quality? If life preserving techniques were being used to save Jamar at HCMC, then, why wasn’t the bullet removed? Any statement that there were no handcuffs because there were no contusions on Jamar’s wrists, presumes that he struggled. An absence of bruising would have been just as likely if, as witnesses claim, Jamar was cuffed without a struggle. Officers Schwarze and Ringgenberg were delivered to the 4th Precinct together in Officer Sworski’s squad car, who self-assigned. Supervision of a sergeant is standard procedure. Therefore, there was quite a bit of time for the officers to talk between themselves after the MVR automatically shut off in the 4th precinct parking lot. The gun in question was handled by Sworski before being returned to Schwarze. This Smith and Wesson brushed Officer Connor’s hat on the dashboard, as well. NO way to handle crucial evidence from the scene of a killing. Why was it not bagged at the scene of the crime with both Schwarze’s and Ringgenberg’s gear? Another failure to secure a crime scene. The officers did not provide their clothing for forensics until December 2015. Is this standard procedure in an investigation? Officers Schwarze and Ringgenberg arrived at 4th precinct prior to the incident for break; and so their videos for the day downloaded and the MVR shut off automatically. It was at 00:40 am that they were called to the scene on a code 3 reportedly arriving at 00:48:14. Since the officers did not activate their emergency lights on the way to the crime scene, the MVR remained off. They chose not to activate it manually. With over 60 responders at the scene of this crime, emergency lights flashing, it begs the question, where are relevant MPD MVR’s from 00:40 to 01:20am on that fateful night? Surely there must have been something of substance on at least one of these videos. Freeman’s one-man jury, using the perpetrators’ testimony above all, was flawed by prejudice. It will not, nor should it be, the last word. Words and/or manipulations of facts to create preferred outcomes will not make any of this right. As it is in art and with any act that uses illusion to portray a particular vision, seeing is believing only to a point. There is no amount of manipulation that will make truth out of a lie.